The numbers in all the three groups follow the same mathematical pattern. Note : The 4 numbers in a square form a single group, and the answer is a positive integer. Please try first without the hints. Hint 1: You have to work on equations involving addition. 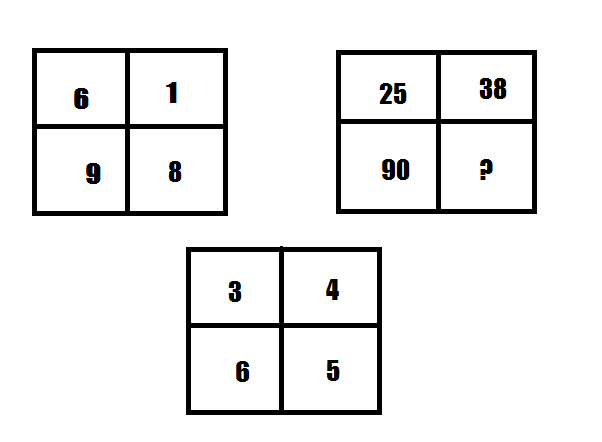 Hint 2: You should calculate the powers of each number. Label the contents of the square A / B / C / D, with A upper left, B upper right, C lower left and D lower right. (A³ + D³) = (C³-B³) for all examples. x³ + 25³ = 90³ - 38³, or x³ = 658503, which solves for x = 87.